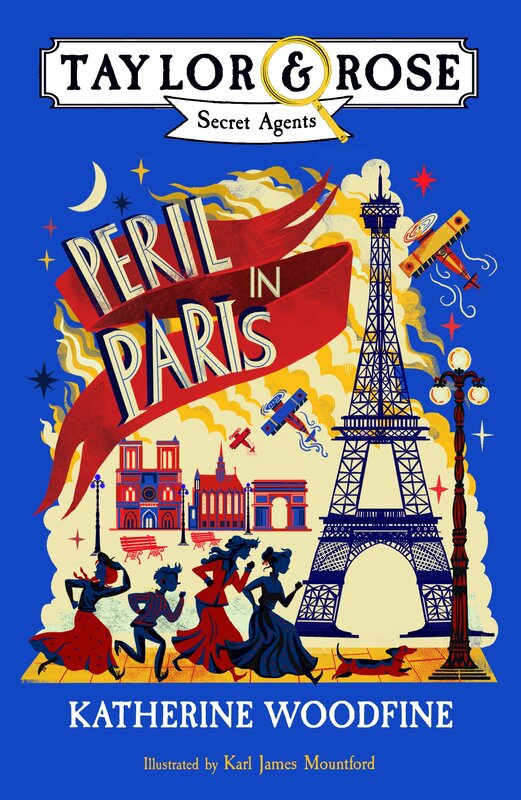 Peril in Paris has already been out in the world for a whole month, and I’m only now getting round to writing about it! That’s because it’s been a super-busy few weeks – not only have I recently moved house, I’ve also been enjoying lots of fun celebrations to welcome the first book in the Taylor & Rose Secret Agents series. As soon as the book hit shops at the beginning of August, I went out and about on a little tour of London to sign lots of copies, including visits to Waterstones branches at Finchley Road, Islington Green, Trafalgar Square, Piccadilly and Kings Road. 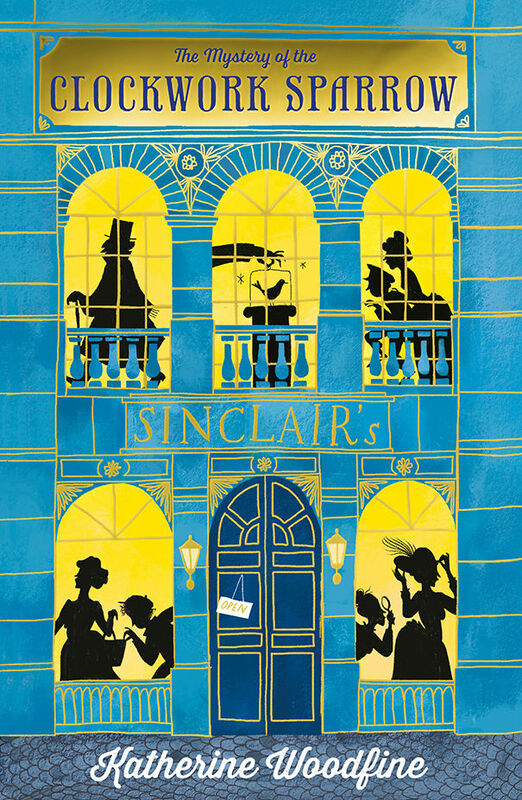 I also made this ‘shelfie’ video for Waterstones in which I recommend some of my favourite children’s books which, like Peril in Paris, have female friendships firmly at their heart. 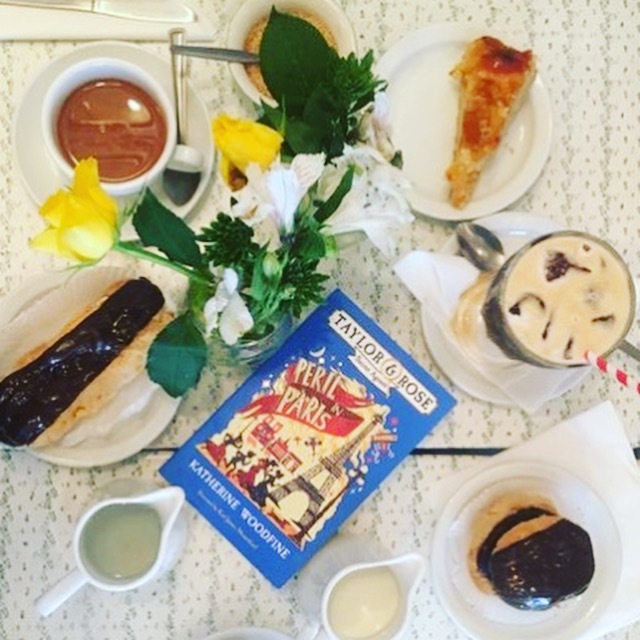 To celebrate the new book, I met up with my brilliant agent and editor for some delicious French treats at Maison Bertaux – magnifique! 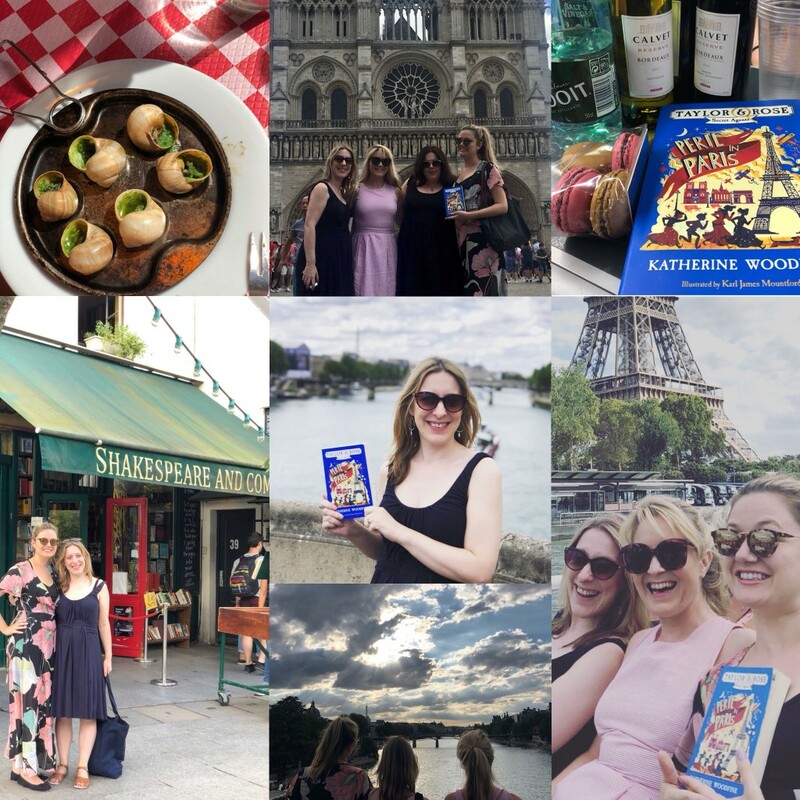 Next, in what may have been one of my most unapologetically ‘extra’ book launch celebrations to date, I headed off to Paris for a celebratory day-trip with my friends Katie, Nina and Claire. We had a truly superbe day enjoying the Paris shops, strolling past the sights, and taking a boat trip along the Seine – as well as eating some tasty French food and taking about a million photos. 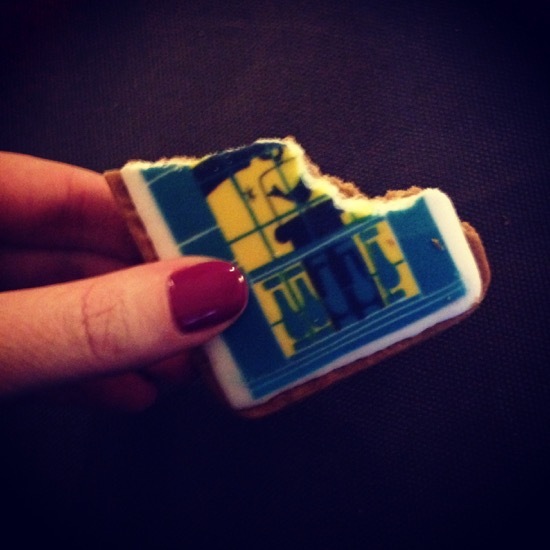 What a treat – thanks guys, I honestly can’t think of a better way to welcome Peril in Paris into the world! 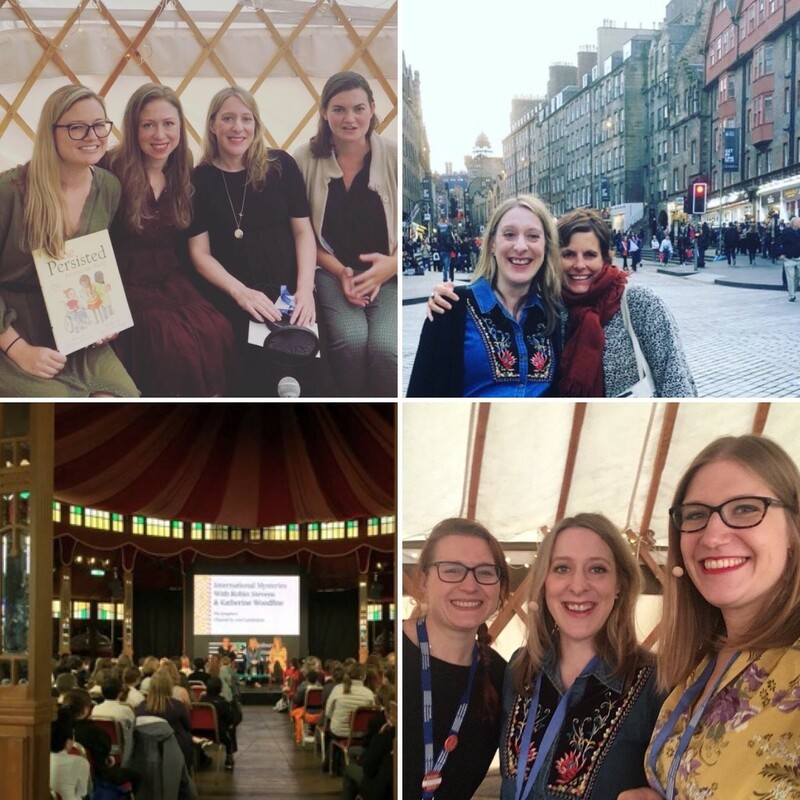 Next up was a trip to the Edinburgh International Book Festival, one of my very favourite book festivals and always a highlight of the year! I teamed up with Robin for an event as part of the festival Schools Programme, and then with Natasha Farrant for an event about thrilling adventures, also featuring her book The Children of Castle Rock. I got to read from Peril in Paris for the very first time; signed lots of books for the readers who came along; and Natasha and I even had a dog join us on stage – I think that’s definitely a first! Another exciting happening at this year’s EIBF was getting to meet the brilliant Chelsea Clinton (see above). Chelsea was in Edinburgh to talk about her new children’s book She Persisted Around the World, and was kind enough to join us for a special recording of Down the Rabbit Hole, where she spoke to me and to her fellow guest Katherine Webber about her book, as well as her favourite children’s books. Have a listen here. 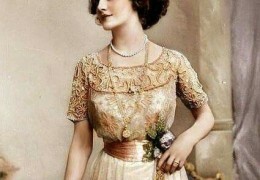 There have been lots of lovely responses to Peril in Paris already: if you’ve read it, do let me know what you think of Sophie and Lil’s latest adventure. If you haven’t read it yet, you can of course get a copy from Waterstones, The Hive or Amazon. 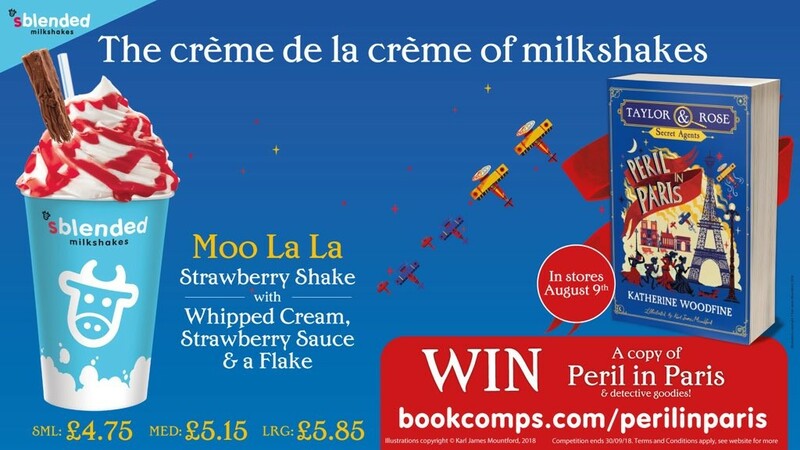 It’s also currently available as part of a promotion in both Waterstones and WH Smith Travel stores, so do look out for it there! 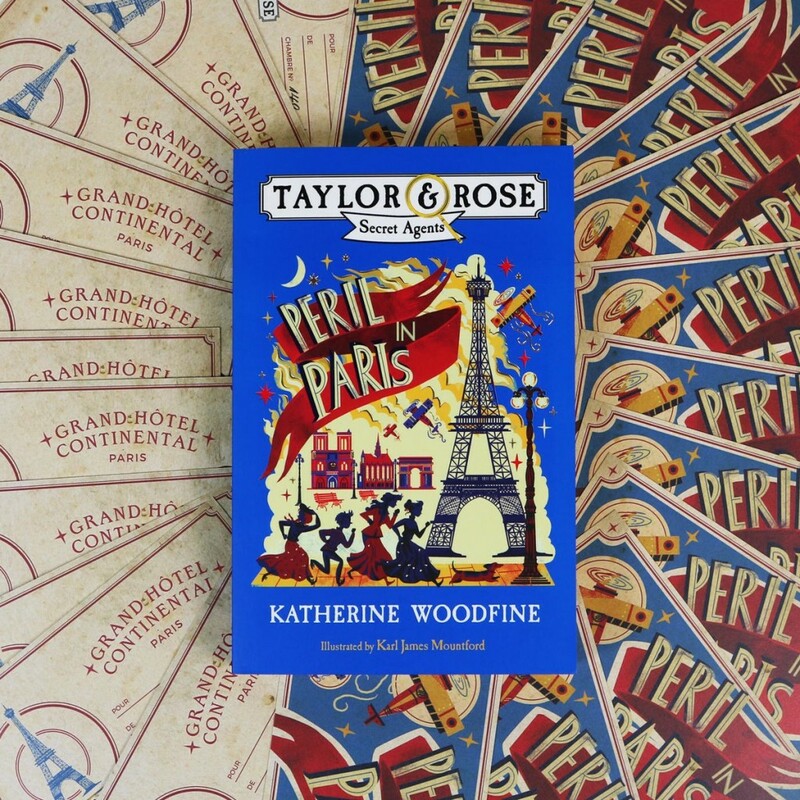 And if you fancy finding out a bit more about the book then check out my Peril in Paris Pinterest board, and stay tuned for some more posts about the historical background, coming up shortly! We’re so excited to be announcing some new developments to children’s books radio show Down the Rabbit Hole today! This morning we’ve launched our brand new website dtrhradio.com, featuring a gorgeous new logo and artwork from amazing illustrator Rebecca Cobb (see above). The website will be an online home for the show, with information and lots of extra content. We’ve also launched a podcast version of the show, available via iTunes. You can pop over to iTunes to listen to our archive, or subscribe – and if you’re a fan of the show, we’d love it if you would also consider rating the podcast, or leaving us a review. Finally, we’re launching a brand new Down the Rabbit Hole e-newsletter. You can sign up to stay in touch with all the latest DTRH news – and to be sure you’ll never miss out on an episode again! It’s been so wonderful to see Down the Rabbit Hole grow and flourish since the first epsisode, broadcast on Resonance 104.4fm way back in February 2014. Melissa, Louise and I are so grateful for all the enthusiasm for the show from authors, illustrators, publishers and readers alike. 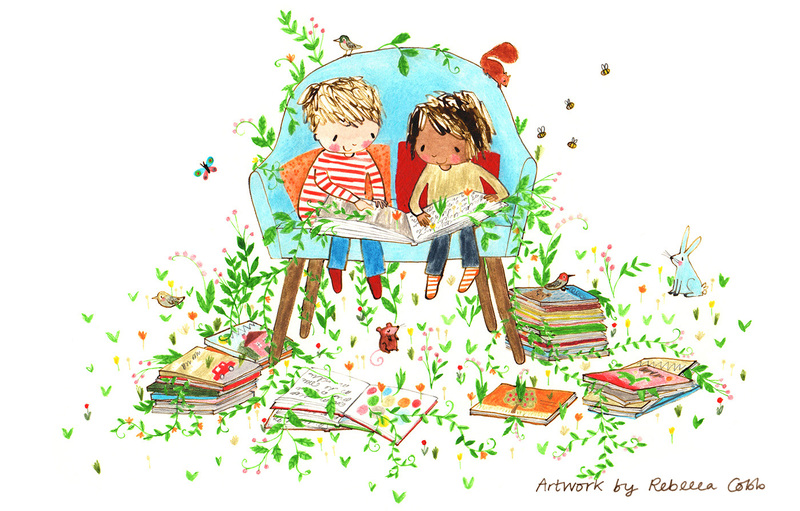 Now more than ever it feels like we are in real need of space to discuss and celebrate books for children – we hope that our new website, podcast and newsletter will offer new ways to help us reach listeners and readers, and to start up even more conversations about children’s books. Visit the new website here – and don’t forget to check out our September episode, featuring journalist, presenter and author Clare Balding talking about her first children’s book The Racehorse Who Wouldn’t Gallop, illustrated by Tony Ross. 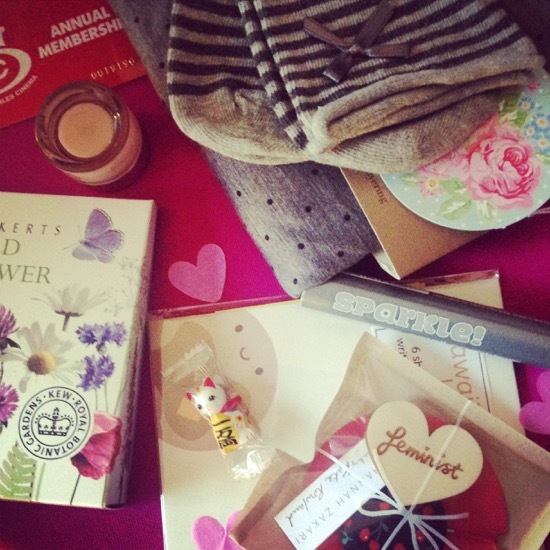 This time last year I wrote this post – 2014 in Pictures – summing up what had been an eventful year. At that point, I predicted that 2015 was going to be even more exciting… and I was right. Meanwhile I celebrated my birthday in the traditional fashion – with cake, drinks and friends! March is also, of course, World Book Day time! 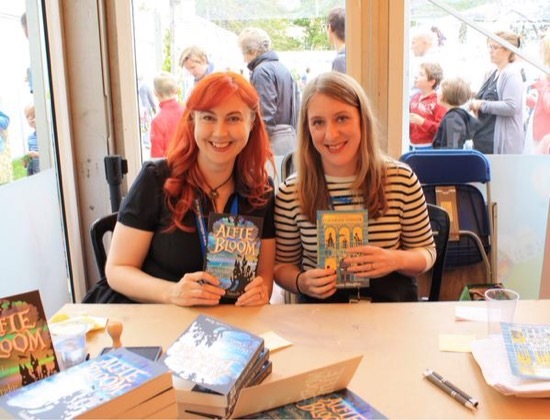 This year I got involved in World Book Day’s Teen Fest, and had a lot of fun interviewing ace young adult authors Non Pratt and Holly Smale on Google Hangout. It was also time to reveal the final cover for The Mystery of the Clockwork Sparrow with artwork from incredible illustrator Júlia Sardà – how gorgeous! 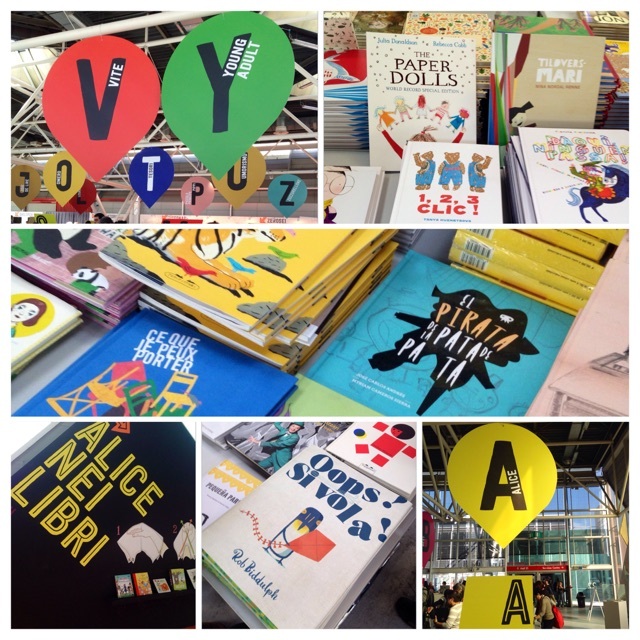 In April, I was very excited to visit the Bologna Book Fair for the first time. 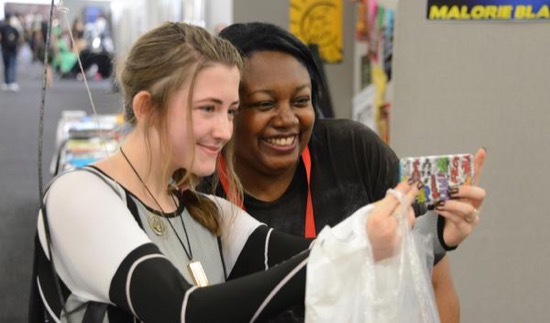 Bologna is the biggest children’s publishing industry fair, and I was there with Malorie Blackman for the grandly-titled ‘International Laureate summit’. Malorie joined a host of other Laureates from around the world to talk about issues including children’s books, literacy and education. Of course, there was also plenty of time to explore the Fair, look at many books, eat a lot of food (including quite a few gelatos!) and track down a Clockwork Sparrow proof on Egmont’s stand – check out my adventures here. Back in the UK, I had a busy few weeks, including giving a talk about YALC at the London Book Fair, and organising an event to celebrate Malorie Blackman’s Project Remix, not to mention working on the sequel to The Mystery of the Clockwork Sparrow – The Mystery of the Jewelled Moth – in between everything else. 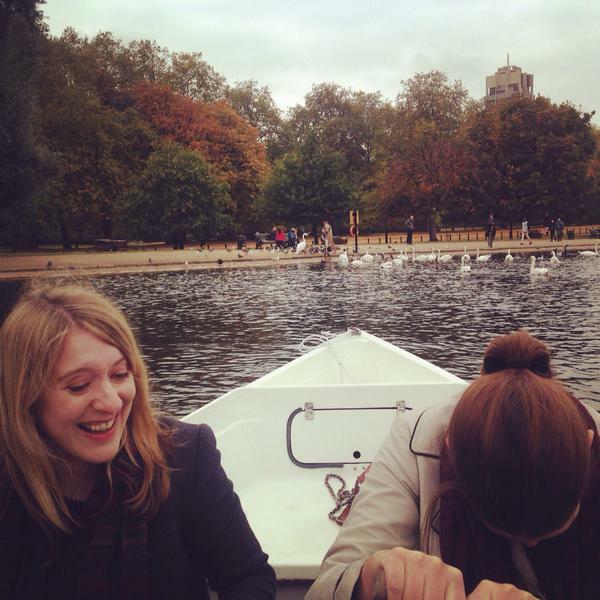 But in May it was time for a break – and a very exciting holiday! I haven’t been away on a ‘big’ holiday for a few years, but as a belated honeymoon, Duncan and I headed off to New York. We stayed in the Upper West side in an apartment in a gorgeous brownstone, and spent an absolutely amazing week exploring the city, and basically eating everything in sight. 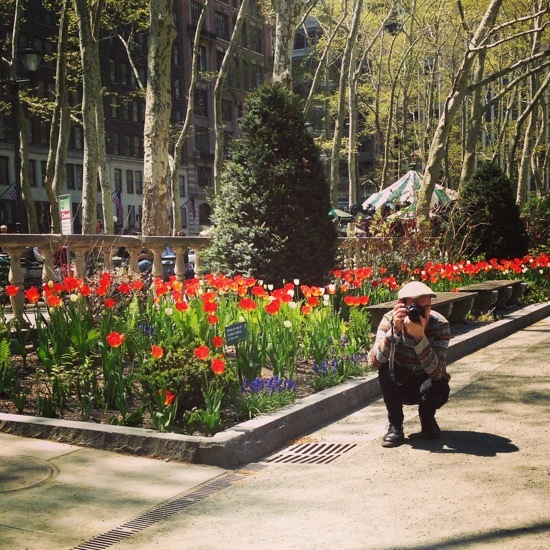 Duncan had to head back home after New York – but my adventure was not over yet. 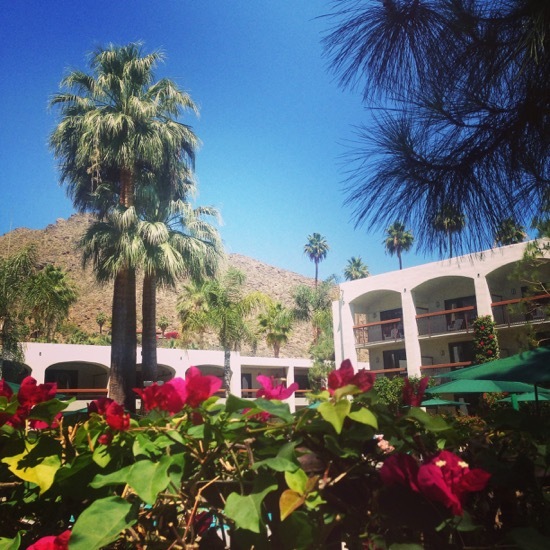 My next stop was Palm Springs in California, for my friend Katie’s wedding! 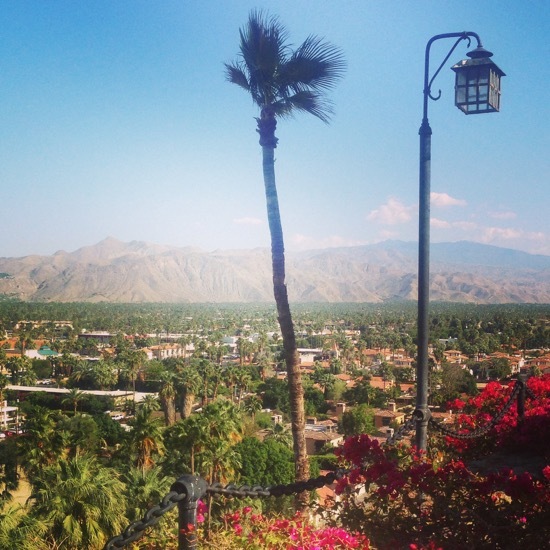 Palm Springs was absolutely incredible – nothing like anywhere else I’ve been before. Katie and Kevin had a gorgeous wedding in these spectacular surroundings, and it was so lovely to be there to celebrate with them. 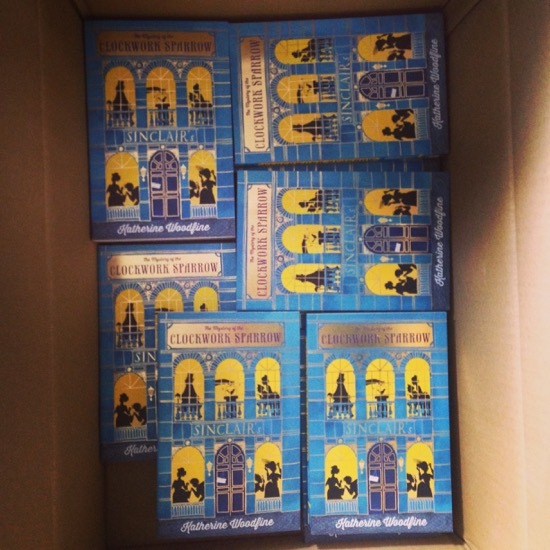 Back home in London, finished copies of Clockwork Sparrow arrived ahead of publication! I couldn’t believe how gorgeous the shiny, beautiful finished copies looked when they arrived in a big exciting box. 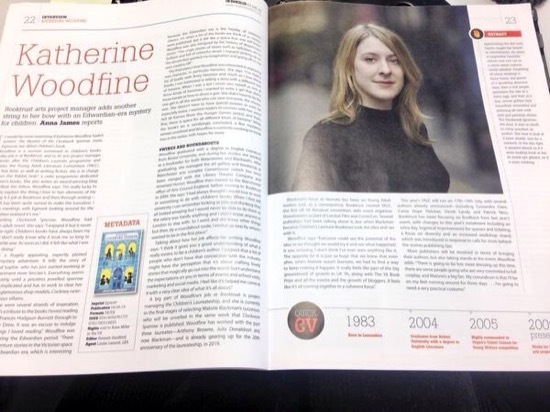 And my first proper ‘author interview’ was also published in The Bookseller magazine! 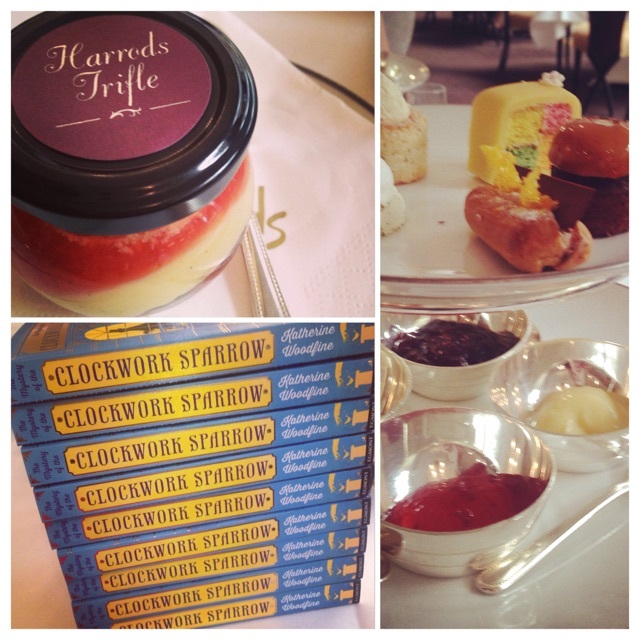 To celebrate all this, Egmont arranged a lovely afternoon tea at Harrods – what better place to raise a glass to Clockwork Sparrow? 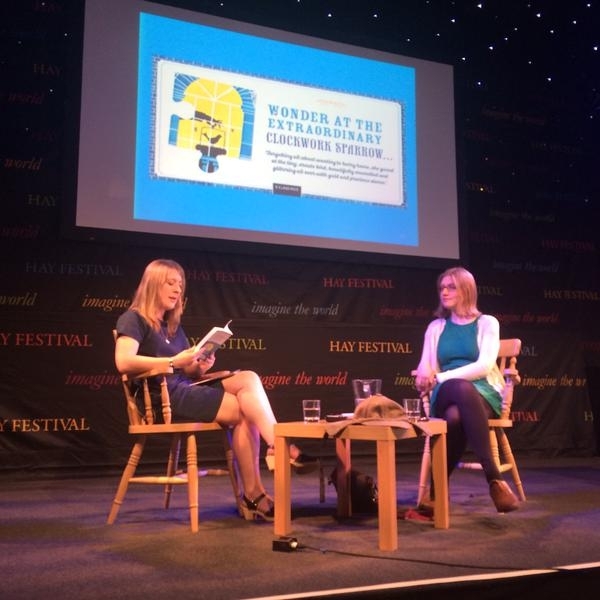 Next up it was time for my first ever author event, at the Hay Festival, where I also espied a finished copy of the book on a bookshop shelf for the very first time! Eeek! 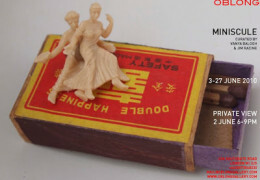 I teamed up with Robin Stevens for what turned out to be the first of several fun events about our shared love of mystery stories. And as well as doing my own author event, I was lucky enough to chair some events with the fab Mel Salisbury and Cat Doyle, Maggie Harcourt and the Bookshop Band, and US YA superstar Sarah J Maas. 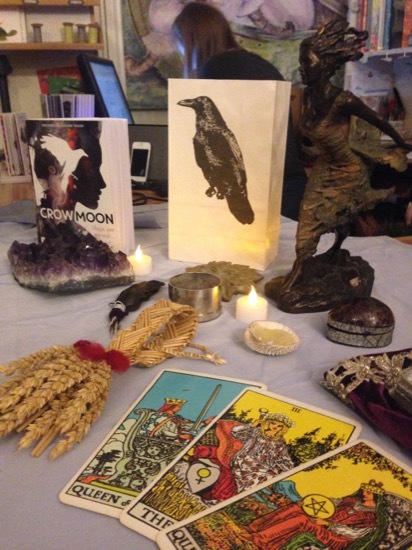 In June, Clockwork Sparrow was published! 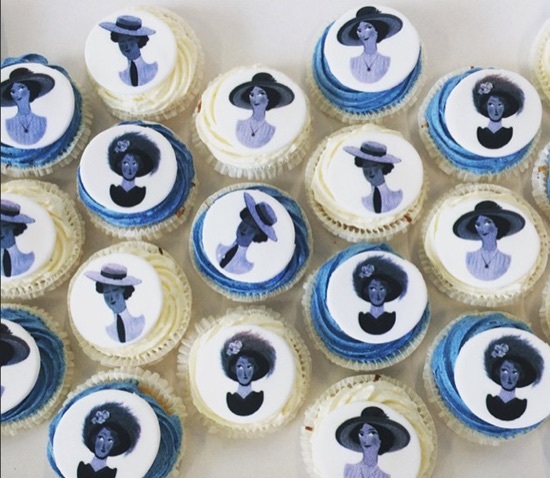 We had such a fun launch party at the appropriately Edwardian bookshop Daunts on Marylebone High St to celebrate – complete with dressing up in lots of hats, and of course, cake! Some fantastic children’s book bloggers took part in the Clockwork Sparrow video blog tour to mark the book’s publication. 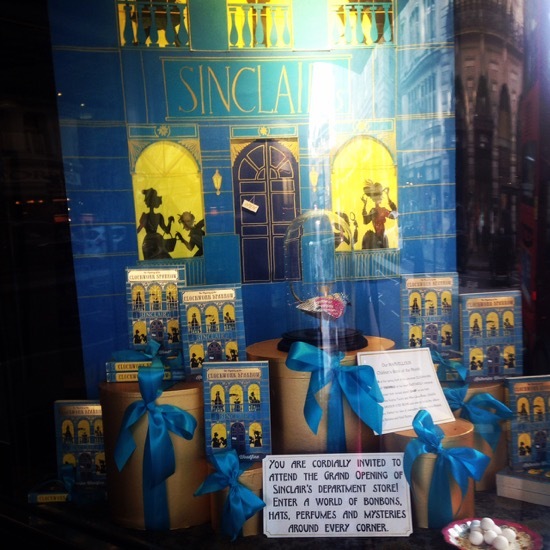 I was overjoyed and so grateful when Waterstones made Clockwork Sparrow their Children’s Book of the Month for June. It was incredible seeing the book in so many bookshops, and even more brilliant to see the fantastic displays that booksellers had made for the book. 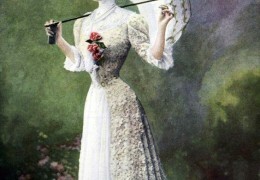 Check out this Pinterest board of all their incredible creations. At around the same time, I was also delighted to be included on The Bookseller’s list of the Rising Stars of the book industry for 2015! After all that excitement, organising the announcement of a new Children’s Laureate was positively relaxing! After two fantastic years, Malorie had come to the end of her term, and in June, she passed on the baton to wonderful author and illustrator Chris Riddell who was announced as the Waterstones Children’s Laureate 2015-2017 at a special event at BAFTA. 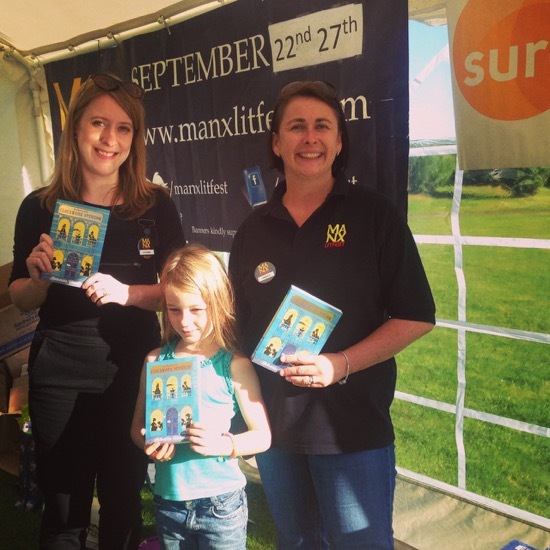 Later that month, I headed up to Lancashire for some more author events. 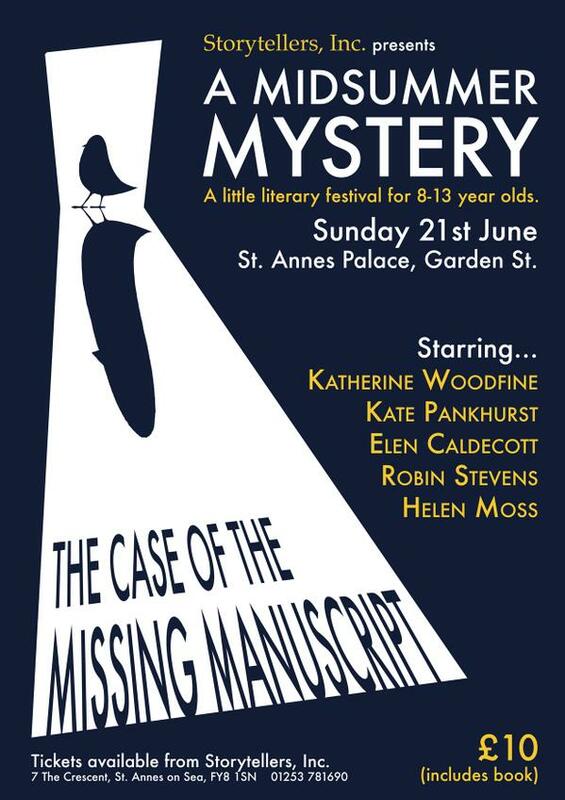 I was lucky enough to be invited to take part in A Midsummer Mystery at Storytellers Inc in St Annes – a fantastic, fun day of mystery-themed events for kids. As part of my trip, I visited a St Annes school with Storytellers Inc and met children from a local Cub Scout group, as well as doing some school events in nearby Chorley with Ebb & Flo bookshop. Doing my very first school events in Lancashire felt very appropriate as it’s where I’m from! 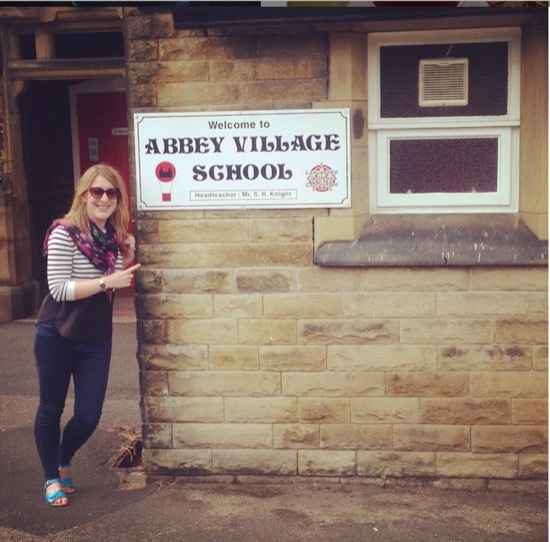 We even went to Abbey Village School, my own old primary school. It’s a really small school in a little Lancashire village up on the moors, and going back there to talk to the children felt really special. Super happy to be back at Abbey Village School! 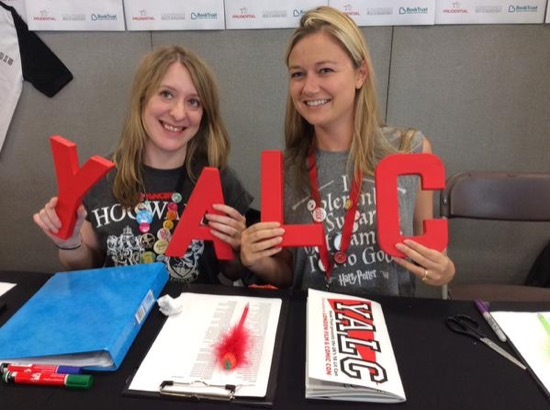 Back in London it was time for lots of summer fun, including of course, YALC! This year’s event was crazy, fun, and (I think!) even better than the last. After three completely intense but fantastic days, Duncan and I headed off to the countryside for a few days of relaxation! We went by train and bicycle to the same spot in a pretty Kent village that we had visited the previous year – it really was the perfect place to relax and recover with a few good books. August was a bit momentous as I finished working at Booktrust after just over six amazing years. I was so sad to say farewell to working on the Children’s Laureate, which has been an immense privilege, as well to lots of other fantastic children’s books projects that I was lucky enough to work on. In particular I was sorry not to have more time working with Chris Riddell on his laureateship, which I know is going to be brilliant. And most of all I was sad to say goodbye to my lovely team. But I was excited to be able to spend more of my time focusing on writing, and to have the opportunity to take on some freelance projects. We celebrated my departure with prosecco, doughnuts and a quiz! But before I had much time to get used to my new freelance lifestyle, it was time to whizz up to Edinburgh for this year’s Edinburgh Book Festival. I love Edinburgh, so I was really excited to be part of the festival programme, taking part in a joint event with fab debut author Gabrielle Kent. Autumn got off to a pretty good start with the announcement that there were going to be two more books in the Clockwork Sparrow series. I also shared more exciting news that the rights to the first book had been sold in Germany and the USA – and there’s going to be an audio book version too! 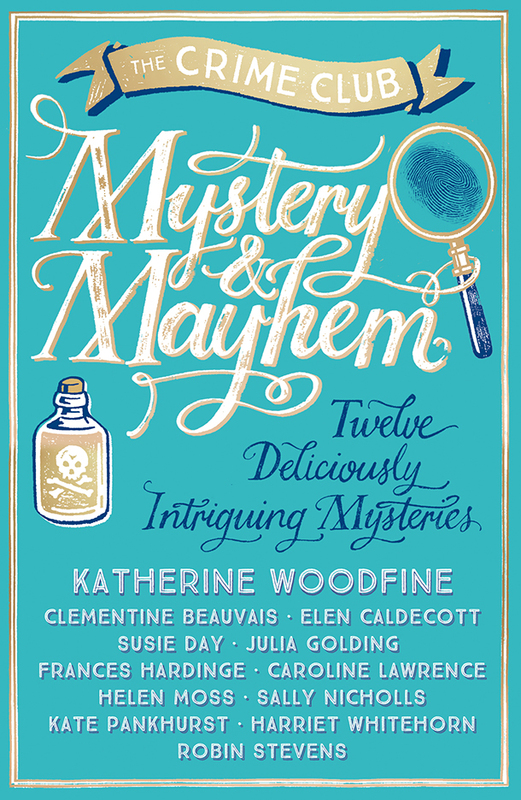 Another exciting autumn announcement was Mystery and Mayhem – a new anthology of middle grade mystery stories coming from Egmont. I was so delighted to be asked to contribute to the book, alongside a list of fantastic mystery authors aka the Crime Club – the book will be published in May 2016. Meanwhile, I had a very busy autumn, packing in all kinds of author events. 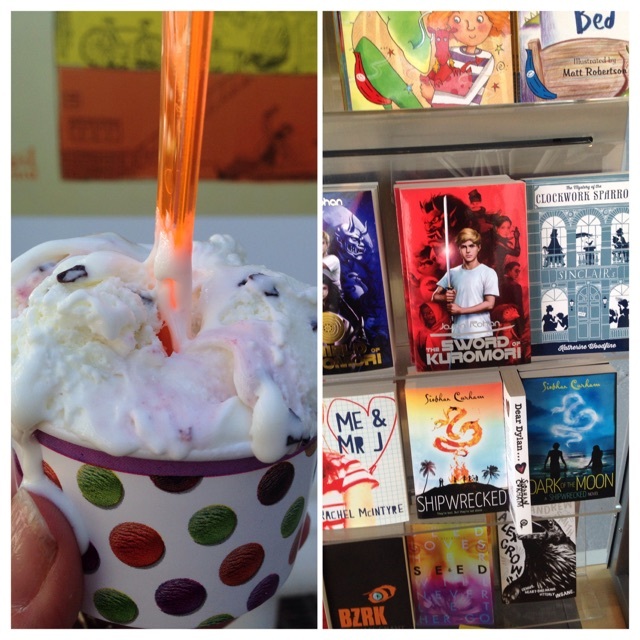 As well as a fantastic visit to the Isle of Man for the Manx Literature Festival, I took part in the Cheltenham Festival, STREAM and YA Shot, as well as school events and a visit to Heffers Bookshop in Cambridge. I’ve had such a great time doing author events this year – huge thanks to everyone who has invited me to visit them! Helping out at the pop up bookshop! I’ve also been busy with some freelance projects, including writing about children’s books for a brand new children’s magazine The Week Junior, and perhaps most excitingly of all, continuing to look after YALC working with Showmasters, who run London Film and Comic Con. 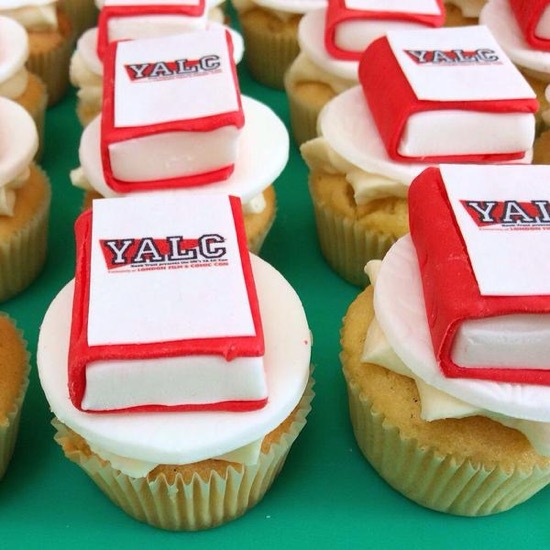 I’m so pleased that I’ll be able to keep working on YALC, which is one of the things that I’m most proud of from my time at Book Trust – bring on 2016’s event! Of course, Down the Rabbit Hole has been keeping me, and my collaborators Melissa and Louise, very busy throughout this year too. 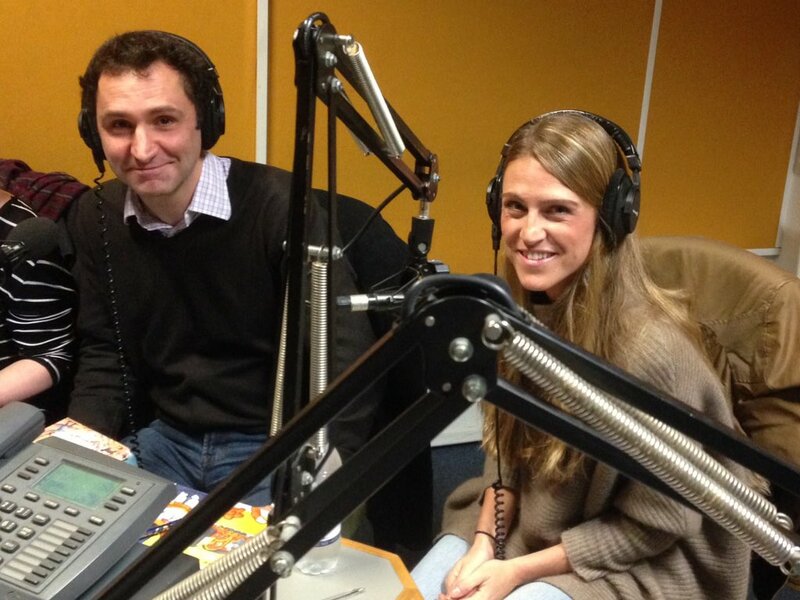 We’ve had a lot of fun on Resonance FM, with some great shows, fantastic guests and amazing author interviews. Our DTRH Christmas special felt like the perfect way to finish off the year! Check out all our episodes from 2015 here. Also to conclude the year, we revealed the cover of The Mystery of the Jewelled Moth – another gorgeus creation from Júlia Sardà. The book also got its first review – from Fiona Noble in the Bookseller who chose it as one of her picks for March 2016 – a great conclusion to a fantastic year! Phew – this has turned into an essay. And that’s without even mentioning all the great books I read, the fantastic events and launches I attended, the exhibitions, films etc. etc. 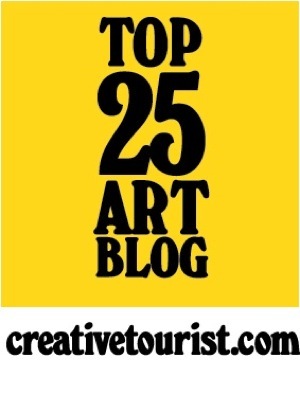 This blog has had a lot of different incarnations – from its early days as very much a personal blog, to the times that I’ve used it to write about books or visual art- but this year, more than any other it really has been a space to document the process of becoming a published author. It seems quite appropriate that today Serendipity Viv has published my contribution to her fantastic Debuts of 2015 & 2016 series, which offered me a chance to reflect further on The Year of the Book – check out the whole series here. 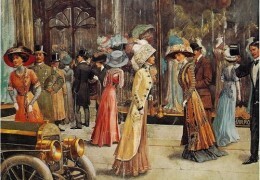 Next year I’d like to write more here about the ‘behind the scenes’ process of writing, which I’ve started to do a bit in the last few weeks, sharing some of the historical research behind The Mystery of the Clockwork Sparrow with this post about real-life Edwardian department stores, and this one about how the real Mr Selfridge helped inspire my own Mr Sinclair. And I’m looking forward to writing too about everything else that 2016 has to bring – publishing two more books (Jewelled Moth and Mystery and Mayhem), getting to grips with my new freelance/author life, lots more writing, and hopefully lots more adventures too. 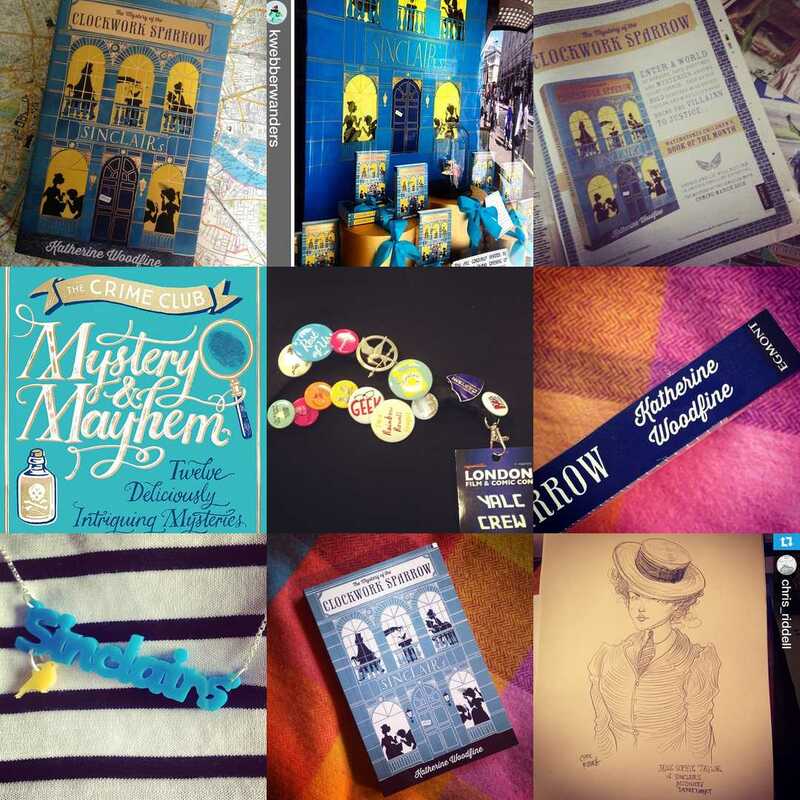 Huge thanks to everyone who has supported me and Clockwork Sparrow in 2015. Happy New Year, thanks for reading, and here’s to a great 2016! This year’s Down the Rabbit Hole Christmas special was an hour-long festive bonanza! 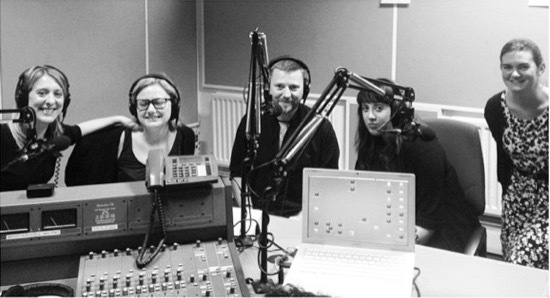 We were joined in the studio by three former DTRH guests: Nadia Shireen, Tom Bonnick and Non Pratt. Our Christmas show included not only some discussions of our favourite books to read at Christmas (listen out for the gorgeous reading from One Hundred and One Dalmatians by Dodie Smith from Nadia, complete with lashings of hot buttered toast) and answering listeners’ Christmas shopping questions, but also our favourite books of the year. You can read about all the books we discussed in the programme on the DTRH website here. The show also featured an interview with Brian Selznick about his book The Marvels – one of the DTRH team’s favourites of 2015 – and a lovely reading of Refuge, a very special picture book by Anne Booth, illustrated by Sam Usher, from Anne herself. 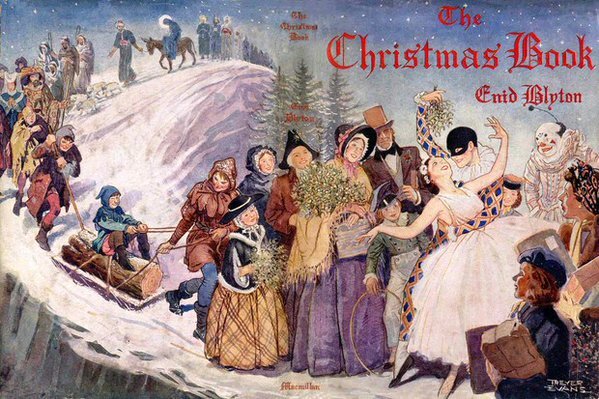 In other festive news, I recommended some of my favourite Christmas reads for the Guardian here – the picture above is from the original dust jacket from Enid Blyton’s The Christmas Book, which was one of my choices. I also told them about one of my favourite books of the year for their best children’s books of 2015 feature. 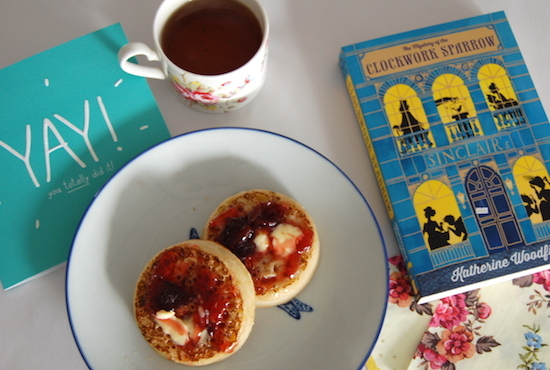 It was so lovely to see Clockwork Sparrow pop up in some of the other authors’ lists of their favourites too! 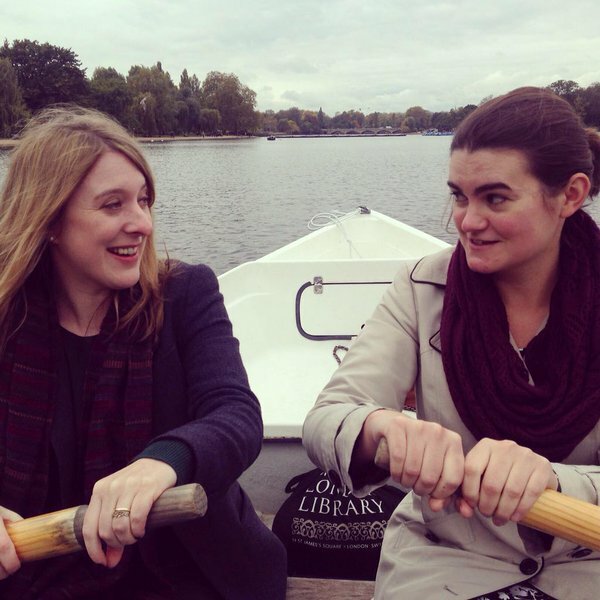 November’s Down the Rabbit Hole saw us back in the Resonance FM studio with two fantastic authors as our guests – Abi Elphinstone and Jonathan Stroud. In this month’s show, we discussed three new books: Shimbleshanks the Railway Cat – a new picture book version of the classic T S Elliot poem, illustrated by Arthur Robins; young adult novel These Shallow Graves by Jennifer Donnelly; and a new edition of Joan Aiken’s first book, The Kingdom and the Cave, written when she was just 17 years old. The episode also featured an interview with Edward Carey about his brilliant Iremonger trilogy, and more from the children of Netley Primary School. We also announced the exciting news that we will be broadcasting an hour long Down the Rabbit Hole Christmas specialths year – tune in on Tuesday 15 December at 3.00pm! For our festive show, we’re inviting listeners to send in Christmas book shopping queries. Tweet us @dtrhradio or email us with your queries and dilemmas, and we’ll answer them on the programme. 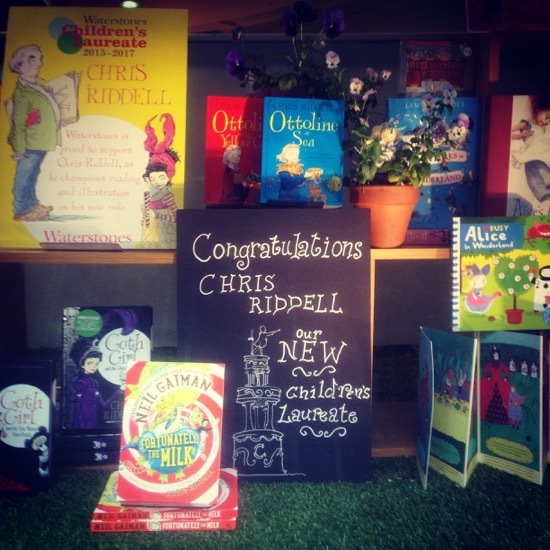 If you want some help with your Christmas shopping before then, you will also find us in the children’s department at Waterstones Piccadilly’s Christmas shopping evening on 3 December from 6.30pm where you can also find a whole host of authors including Chris Riddell and Rob Biddulph, music and song, cakes, cocktails and lots more festive fun.